Okay, it’s a long time coming, but we’ve finally reviewed Cuphead. I’ve been trying to get through this game in order to give you all a comprehensive and detailed review. But one thing stood in my way, the game itself. Cuphead is hard, even on it’s easiest setting. I liken it to a 1930s take on Dark Souls. If, of course, the 1930s knew anything about video gaming that is. 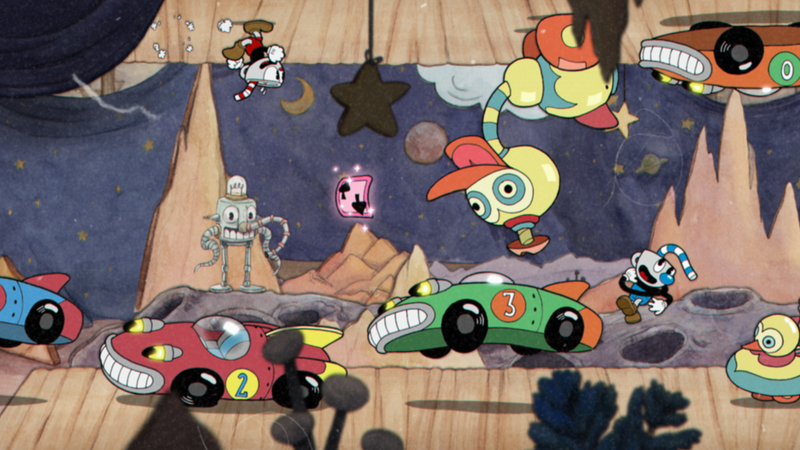 Cuphead can simply be described as a colourful, side-scrolling run-and-gun game. 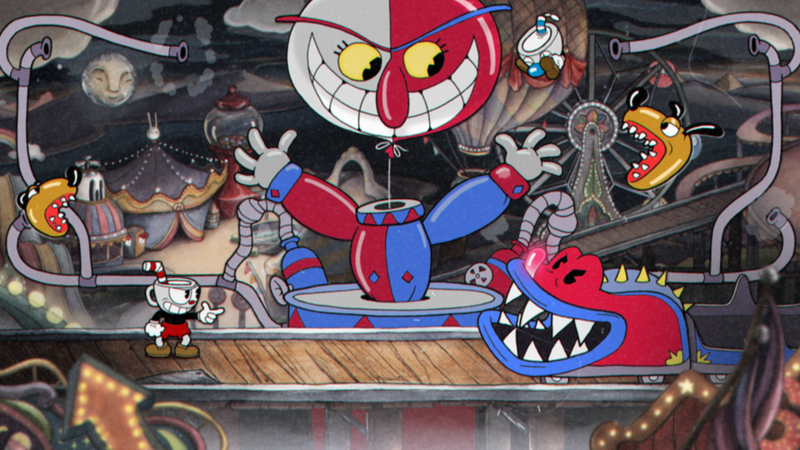 The game focuses on the two main characters in the game: the brothers Cuphead and Mugman, who, after making a dodgy deal with the Devil, regret their over enthusiastic attempt at getting rich quick, and lose their souls. In an effort to ensure they keep their souls they agree to running a few errands for the guy in horns, and encounter a number of entertaining and testing enemies throughout. Despite the cacophony of colour in some areas, the levels are well laid out and easy to navigate. 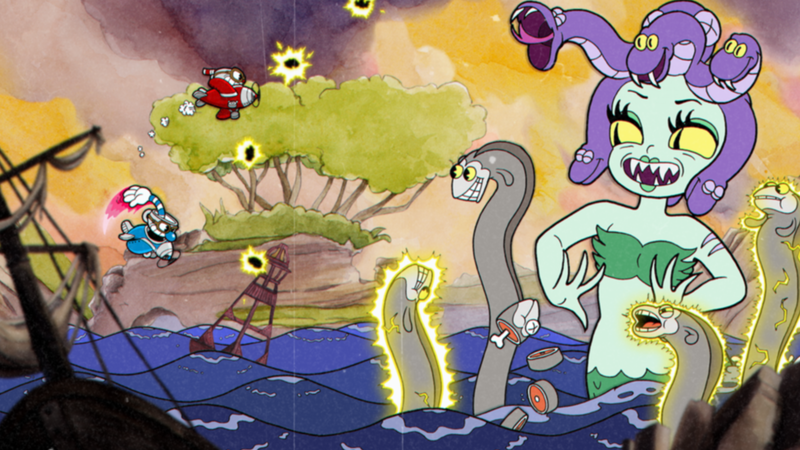 As gameplay goes, Cuphead is a smoothly flowing, action-packed, title. With the freedom to choose your route on the island of Finkwell, more or less, the game is never stagnant or restrictive in progression. Which means if you’re struggling in one area you can move on to another section until you feel ready to re-visit the original hurdle. The problem here, though, is the number of hurdles. The regular run-and-gun sections, though challenging, aren’t the issue. You can get though those without too much difficulty. But it’s the boss battles that really test your mettle. Despite the seemingly impossible hurdle ahead of you, there are ways to get around them. Trips to the shop on the island can result in better weapons or extra lives, and the coins needed to get these ‘charms’ are earned via the standard run-and-gun missions. And unlike the side-scrolling run-and-gun missions, the boss fights levels are fairly static, forcing you to be creative in your jumping and ducking. Despite the difficulty of the boss fights, some of which can involve 30 or more attempts, the end result is very rewarding. There’s nothing quite like perfecting a boss battle, or scraping through by the skin of your teeth and winning to make you feel like a champ. And that’s something that’s often missing from most modern games – a true sense of achievement. But Cuphead ensures your efforts are recognised. Each boss fight is distinct. And painfully difficult. But despite the apparently seamless levels and the choice of avenues in completing the game, including the sneaky routes around the island map, there are a few areas that could do with polish or adjustment. The boss battles are relentless, much like the old arcade days of R-Type, which isn’t entirely a bad thing. But unlike Dark Souls’ approach which allows brief moments during boss fights to size up you opponent and plan you next move, Cuphead simply fires more projectiles at you or varies the sequence of the attacks to catch you off guard. But regardless of the approach it certainly keeps you on your toes. So I would advise plenty of run and gun, with frequent visits to the shop to purchase charms for added lethality and survivability. It’s hard to ignore the other standout aspect of Cuphead. In this case the art style. 1930s styled art rarely features in modern gaming, but here it’s awash with bold imagery and booming voices that wouldn’t be out of place in the original Tom and Jerry cartoons. It’s Steamboat Willie meets Darks Souls, with hints of 1980s 2D side scroller thrown in for good measure. Though the art is different, I found myself thinking back to the old Batman and Double Dragon games from the Spectrum days. Simplistic, fun but brutal and unforgiving. The variety of the levels and boss battles keeps the game fresh and interesting. And using two players doesn’t make it any easier. Thankfully, Cuphead is free of 10 minute loading sequences that frequently result in a soul-destroying crash. Put simply, the art is amazing and wonderfully diverse. It’s as far from it’s contemporary counterparts as it’s possible to imagine, and the 2D aspect adds to that. In fact it’s perfect. Making Cuphead a 3D game would have been far less appropriate. On paper, Cuphead should seem like an uninspiring revival of 1930s artwork, coupled with simplistic, 2D side-scrolling gameplay. But it’s in the simplicity of its gameplay and the prohibition-era art that the game truly delivers. And despite the relatively childish style of the game, it’s certainly no pushover.